The World’s Tallest snowman is actually a snow-woman. The town of Bethel, Maine built the snowwoman Olympia (named after Maine Senator Olympia Snowe) in 2008. She was 122 feet and one inch tall and took over a month to build. She had 27-foot evergreen trees for arms and old skis for eyelashes. The Hkasima-Nilasari Culinary School in Jakarta, Indonesia made a cake measuring 33 meters or 108.27 feet for the event Amazing Christmas. It was on display from Nov. 28 – Dec. 8, 2008, and weighed more than 20 tons! 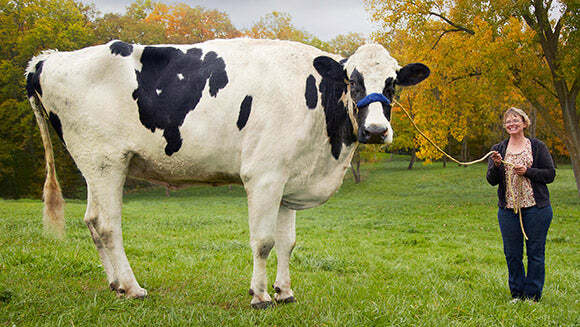 Blosom, a female Holstein stands at an impressive height of 74.8 inches, which is over 6 feet. Blosom was born to two normal size cows and lived in Orangeville, Illinois. She sadly passed away in 2015 after sustaining an irreparable leg injury. The port city of Jeddah, Saudi Arabia takes the bragging rights of the world’s tallest lighthouse. The lighthouse of Jeddah is 436 feet tall. It is different from conventional lighthouses since it acts as a control room for the city’s harbor and port. Hans-Peter Schiffer of Karst, Nordrhein Westfalen, Germany holds the record of growing the world’s tallest sunflower. The sunflower measured at 30 feet, 1 inch in the summer of 2014. Hans-Peter has held this record two previous times. As of June 2015, Milan, Italy holds the record of the tallest structure built with LEGO bricks. The LEGO tower stands at 114 feet, 11 inches tall. Over a half a million LEGO bricks were used to create the tower. It took five days to build and thousands of LEGO enthusiasts contributed to the tower.